All I can say about yesterday is…it SUCKED!! I have never really been a fan of Mr. Newman and after yesterday, I don’t think I will ever be. On Lap 91 Newman…pretty much killed Tony’s day. Tony was running good. He qualified 5th and could have contended for the victory, but that damn Alltel car ruined his day. Tony finished 37th and dropped him out of the top ten to 11th in the standings. 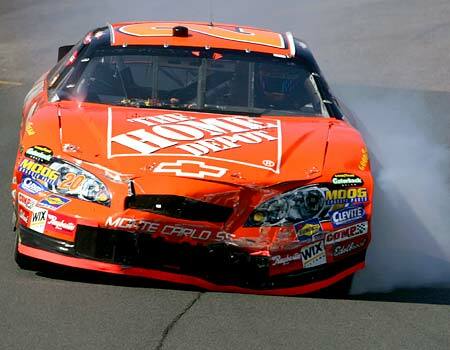 Of course the NASCAR karma has a way of rearing its ugly head–what goes around comes around. Just 4 laps later Mr. Newman is tapped from behind by Michael Waltrip and spins around. His day is ruined as well and that pretty much sealed his fate. He will not make the Chase unless there is some divine intervention. Maybe–Tony should find a Newman pinata instead of a Jeremy one. Hey Mikey…get the door…it Dominos…a pizza on me. It looked like Elliott was going to have a decent finish, but as always hope faded away. A few late cautions and the overtime killed any hope of a great finish (something he needed). Elliott finished 25th. Of course, the buzz around the track this weekend was Elliott’s possible move to Everham and the #19. We all have heard the Jeremy hasn’t been happy over at Everham and well there’ s an offere on the table for Jeremy to drive for Toyota and Michael Waltrip next year. This move could open up the #19 for Elliott. I wouldn’t mind Elliott going to Everham. Everham is a good organization and is on the rise. 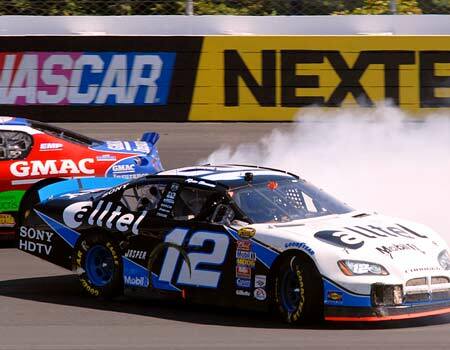 Everham is a proven winner–I mean Kasey has won 4 races this year and Scott Riggs is a decent driver. The rumor is if Elliott leaves RYR for the #19 M&Ms will go with him. M&Ms has to go with him…HE IS THE CANDYMAN!! 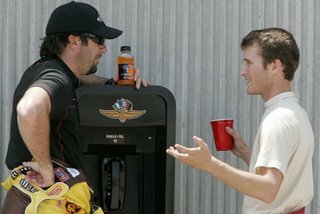 Hey–is that Kasey persudaing Elliott to come over to Everham and drive with a real team..he he. Oh yea…Little Shrub won the race. Next week the boys are headed back to Pocono.